We got the best vodka! SEND ME INFORMATION ABOUT THE VODKA AND PRICES. Do you have a vodka called Russian Vodka. The bottle has a yellow label with an Eagle on the front. It took time to decode the name. It’s vodka “Yoshkin Cat”, which is named after Mari autonomy’s current name: “Yoshkar-Ola”. Translated from Mari – “Red City”. So, loosely translated this vodka is named after a cat from “beautiful” city. The name of the vodka is correct (we see it around town sometimes), transliterated as “Yoshkin Kot” meaning “Yoshkin Cat” but the given meaning is wrong. This has nothing to do with “red cat”. “Yoshkin Kot” is a euphemistic exclamation that people use instead of swearing outright, as one might say “Doggone it!” or “Gee willikers!” in English. The “‘Yosh” bit has phonetic similarities to a certain class of foul word in Russian, much as “Freakin’ …” is an allusion to a F word in English. So to utter “Yoshkin Cat!” is a bit like exclaiming, “Freakin’ Cat!” in English as a pseudo-cuss phrase. 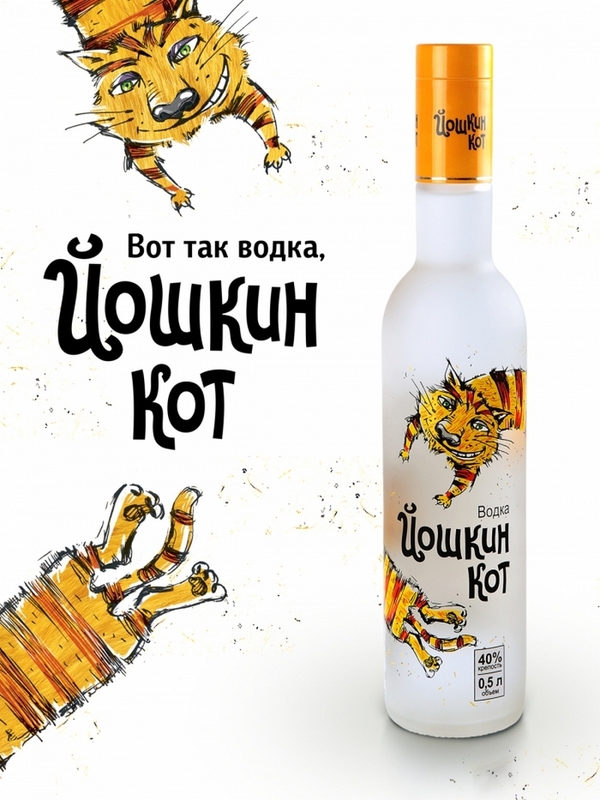 As a result a “Yoshkin Cat” is a naughty cat, a clever choice for a vodka brand seeking to portray a party-animal image. It’s true, by the way, that the capital of the Republic of Mari El, Yoshkar Ola, has a famous bronze statue of the Yoshkin Cat lounging naughtily on a park bench by the university. I was just there, as it turns out, last weekend. But the statue is a completely recent addition as part of Yoshkar Ola’s trying to make itself over as a tourist destination after suffering an economic collapse with the fall of the Union in the early 90?s. “Yoshkar” does indeed mean “red” in the Mari language but it is just happenstance that it shares a phonetically similar first syllable with both the cussword and the Yoshkar Cat euphemism. But that happenstance was enough for the clever tourist promoters of the town to grab the Cat as a sort of local mascot.